Your backpacking tent is pretty much a superhero. It shields you and your gear from the bugs and the elements while you sleep. But tents also need to be lightweight enough to carry with you over rough terrain, small enough to fit into less-than-ideal campsites, and easy to set up with practice. The rain fly should be well-ventilated to keep condensation to a minimum, and designed well enough to keep you warm and dry even in the windiest and wettest of conditions. After scanning the forest of information on tents on the internet, we found the 14 most popular and beloved two-person tents. From there, we narrowed it down to the 7 best. 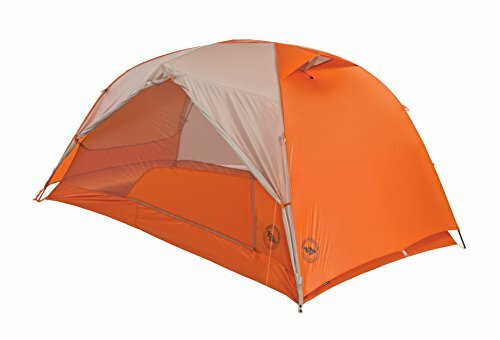 The overall best tent is the Big Agnes Copper Spur HV UL 2, which was among the most highly rated by reviewers for its two doors, large vestibules, and extensive storage. Those on a budget liked the Eureka! Midori 2 for the space and storage available for the price. 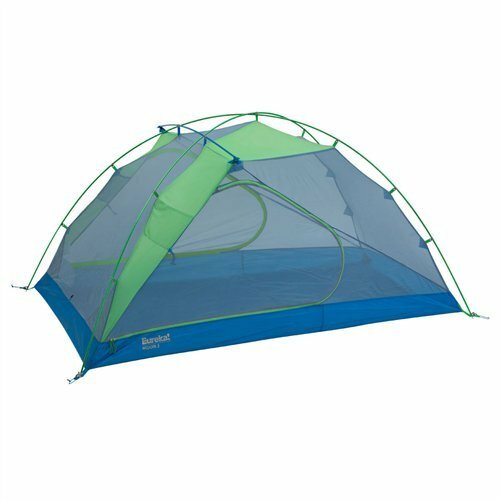 For versatility, reviewers prefered the REI Half Dome 2 Plus for its ability to transition from car camping to backpacking. Other highly rated tents included the lightweight Nemo Hornet 2, the livable MSR Hubba Hubba NX, the lighter and cheaper Tarptent Double Rainbow, and the single-door Big Agnes Fly Creek HV UL 2. Curious what tents made the cut? To separate the best from the rest of the herd of backpacking tents available, we researched the most popular comparative reviews of backpacking tents. Based on those reviews, we aggregated their findings. These backpacking tents consistently get the highest marks from the most reviewers at Outdoor Gear Lab, Outside Magazine, Backpacker Magazine, Wirecutter, Switchback Travel, Section Hiker, Adventure Junkies, Gadget Review, and The Big Outside. From there, we narrowed down the 14 most popular tents. Then, we read hundreds of customer reviews on Amazon and REI. From there, we verified those reviews against FakeSpot, a platform that flags fake reviews. Using the professional sources, our own experience, and conversations with dozens of users, we established the most important criteria for two-person backpacking tents. From there, we narrowed our list down to the seven best backpacking tents. After analyzing and aggregating hundreds of customer and professional reviews, we identified 14 backpacking tents for two people that were received the highest marks. Using the following criteria (aside from price), we narrowed that list down to seven tents that should fit the needs of most backpackers. Most backpacking tents have an advertised sleeping capacity of one, two, or even three people. The stated capacity, however, is not always appropriate for all sleepers. Always check the measurements on a potential tent to be sure it will fit your needs, particularly if you’re tall or traveling with a human or canine companion. Length and width are important, as is knowing whether or not a tent narrows at the feet to save on weight. If you’re going to be spending more time in your tent, find one with a height comfortable to sit up in. Square footage for each of our top picks. Small differences can mean big differences in how the tent functions. Diagram by Naomi Hudetz. Weight icon in background by Freepik from Flaticon is licensed by Creative Commons BY 3.0. The number of doors on a backpacking tent are generally suggestive of the tent’s capacity as well. One-door models are better suited for one person, where two-door models are less cumbersome for two people to use. While all of Treeline’s backpacking tents have a suggested capacity of two people, some are roomier than others. For example, the Nemo Hornet 2 and the Big Agnes Fly Creek HV UL 2 are better choices for one person and their gear, though they can squeeze two people in. If you’re backpacking in places with significant rock or sand - where you might not be able to stake your tent down - a freestanding backpacking tent might be right for you. Freestanding tents can stand on their own, without the use of stakes or guylines. Non-freestanding tents must be staked out to stand. Semi-freestanding tents can work with or without stakes, but lose precious room when not staked out. Of our recommended backpacking tents, the Big Agnes Copper Spur HV UL 2, the Eureka! Midori 2, and the REI Half Dome 2 Plus are all freestanding, where the others are semi-freestanding. Though these tents can be pitched without the use of stakes, a tent is always sturdiest when properly staked out, so we recommend staking and securing guylines in all but the best of weather. Tents come in double-wall and single wall. Above, the hiker has only set up one layer: the mesh. He is drying clothing on the outside of his mesh tent body. Photo by John Carr. With the exception of the Tarptent Double Rainbow, all of our picks for tents are double wall tents. Double wall backpacking tents provide two layers of protection between sleepers and the elements: a tent body, often primarily mesh, and a rain fly, made of a weatherproof, protective material. Double wall tents have better ventilation, since air can move between the tent body and the rain fly. Single wall backpacking tents only have one layer of protection, though they too have some ventilation. Since ventilation is limited, single-wall tents are more prone to condensation than their double wall opposites, but double wall tents usually weigh more. Even when you are hiking by yourself, a two person tent can be a good option to increase your storage ability. Photo by John Carr. While no one quite brings the kitchen sink, everyone has different ideas about how much gear to bring on a backpacking trip. Some prefer as many comforts as possible, where others are looking to cut weight where they can. More storage options mean more weight - something many of our ounce-conscious readers are looking to avoid. For our backpacking tent picks, we selected tents with a range of storage options, from small, simple pockets, as on the Big Agnes Fly Creek HV UL 2, to integrated gear lofts, as on the Eureka! Midori 2. Tents either use fabric sleeves or plastic clips to secure the body of the tent to the poles. While pushing the pole or poles through fabric sleeves was once more common, attaching clips to the poles instead generally provides a faster, easier setup. With the exception of the Tarptent Double Rainbow, all of our suggested tents have a clip setup. Weight of tent as reported by the manufacturer. Absolute weight is just one way of measuring the weight of your tent. n most cases, higher square footage tents will weigh more. See the above chart for weight of tent vs. square footage of tent. Diagram by Naomi Hudetz. Weight icon in background by Freepik from Flaticon is licensed by Creative Commons BY 3.0. While ultralight backpacking shelters are a subject for another review, weight is still a concern for those carrying their tents down a trail for miles at a time. More room and storage in a tent generally means more fabric, and more weight to carry. More doors and vestibules means more zippers and added weight as well. Although we don’t recommend it, if you intend to pitch your backpacking tent freestanding, you won’t need stakes, which means less weight to carry. All weights mentioned for Top of the Line tents are fully packed weight, to indicate the combined weight of the tent and accessories. Trail weights for each tent may be lighter, if removing stakes, stuff sacks, or extra cord. Here we show square footage per pound of tent. Is that extra weight worth it in terms of space? Diagram by Naomi Hudetz. If you’re not sure whether a tent will be wide or long enough for you, consider using masking tape to tape out a tent’s floor dimensions on your floor. Lay out your sleeping pads in that tape-tent to see if they fit comfortably. The walls of any tent will slant in at least a little, so make sure you have a few extra inches on all sides for adequate room. If you’re planning to spend an extended amount of time in your tent, or camp for many nights in a row, a good rule for lightweight shelters - those at or around two pounds - is to purchase a tent designed for one more person than will be sleeping inside. For one person, a two-person tent will provide enough room for stuff and gear. For two people, a three-person tent might be best. If you’re going on the occasional backpack, a two-person tent for two people will work - but don’t expect to have a ton of room. Before you pack up for your trip, make sure your tent is seam-sealed to prevent potential water leakage at sewn seams. Many tents come from the factory seam-sealed, but others, like the Tarptent Double Rainbow, do not. We like the Gear Aid Seam Sealer. Find a dry place and budget a few hours. This is also a great time to attach guylines, and add more if you need them. When camping above treeline, sometimes a modest bush may be your best protection from the wind and elements. Photo by John Carr. The best way to stay dry in a rainstorm? Location, location, and pitch. When you’re looking for a spot, you’re ideally looking for the ground to be at an ever-so-slight incline under a copse of trees with enough space for you to secure all your stakes and guylines. The incline will prevent water from pooling under your tent, where the trees will reduce your exposure to wind, rain, and condensation. None of these will save you if you don’t have a tight pitch, so make sure you get enough tension in your tent by staking it out before setting it up with the poles. And pitching the nose of the tent - the side with the least surface area - into the wind will lessen the risk of pole bending or snapping. And another thing on location: Leave No Trace by camping 200 feet from water and trails to protect the environment and others’ experiences. Dry your tent to reduce chances of foul odors. Photo by John Carr. If you’ve got to pack your tent up wet, try to pack the rain fly separate from the body, and make time to dry it during the day. Setting up and sleeping in a wet tent, even on a dry evening, is no fun. Preserve the life of your tent by cleaning it. Make sure you empty the tent body before you put it away to prevent abrasion from rocks and other junk while in your pack. In between trips, apply zipper lube to make the zipper last longer (don’t make the mistake of thinking lip balm will achieve the same goal - we learned the hard way). Before storing your tent for extended periods of time, make sure the tent is clean by soaking it in a bathtub of cool water, and hang it out until it dries completely. This additional care will extend the life of your tent. Curious about what backpacking tents made our list? Read Treeline Review’s Best Backpacking Tents of 2018 full comparative review here or check out the comparison chart.